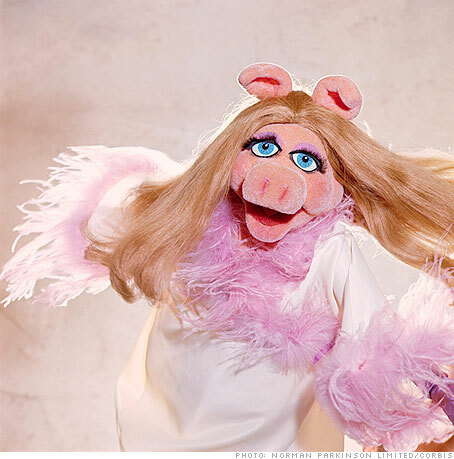 I used to love watching the Muppet Show as a kid and I absolutely adored Miss Piggy. I found some lovely quotes by her – made me laugh – and I thought I’d share them. She really did know what she was on about…! It’s a good idea to apply an all-over facial pack once or twice a month, but I never, never use mud. (Frankly, it brings up unpleasant memories.) I recommend my own special facial mousse, a mixture of mocha cooking chocolate, icing sugar, eggs and cream (adjust the proportions to your own taste). The mousse should be beaten with a wooden spatula as if you were frosting a cake. If there’s a little bit left over, it is quite all right to taste a teensy bit. Often the only view we have of ourselves is from a mirror or photograph. Due to defection, refaction, conflection and infliction, mirrors always make you look larger in the wrong places. (An important scientist at a big university in a famous place discovered this.) And cameras do lie, because of all kinds of strange optical things and complicated gizmos that break and give you the wrong shortstop or spoil the focus-pocus, and little hairs that get stuck inside and goo on the film. 1. Heat the milk, sugar and chocolate together. Beat in the yokes, then whip the vanilla and egg whites. Combine all ingredients. Place in the oven on a low heat. 2. Go out straight away and have your hair done. 3. Come home. Remove the mixture from the oven. Cover lightly with whipped cream and eat. Physical fitness as well as Unhealthy weight, nevertheless roman policier ennemi, fitness can often battle morbid obesity. Being overweight is actually speedily for pandemic. Children and adults the two endure weight problems, little ones much more in particular. One inch every five children is affected with weight problems. It is time for people for this in addition to struggle this growing epidermic.